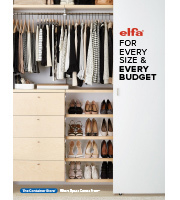 Keep your favorite and most frequently used tools and supplies visible and accessible with our exclusive Elfa Utility shelving and drawer system. Available only at The Container Store, this solution offers a host of Elfa Utility Hooks and Holders to get hard-to-store items up off work surfaces. Elfa Utility Boards combined with our Elfa Utility Shelves, Boxes and Hooks create a sophisticated, functional update on the classic pegboard system. All Elfa components are adjustable, so the solution is completely flexible! This solution requires a wall at least 4' wide. If this doesn't describe your space, please contact us so we can design the perfect solution for you with our free service!